A selection of Dyson’s collages are on show in Berlin, in an exhibition that looks at how she creates futuristic, sometimes psychedelic – she remembers the “huge appeal of cutting up childhood encyclopaedias and books to create subversive and hilarious images” – scenes using vintage imagery. The natural world is a recurring motif – birds, slugs, snakes and lizards are among the animals that make appearances – alongside human elements in the images, which might be men in suits emerging from egg shells, or a woman lighting her cigarette in the smoke of an erupting volcano. Such bizarre and surreal worlds make for compelling viewing. Introducing less elements into a collage is something Dyson is currently enjoying. “I went through a phase of making super detailed collages,” she explains, “but now I’m attempting to pare back, and put my more detailed ideas aside for my animation projects where being obsessive is a more useful skill. 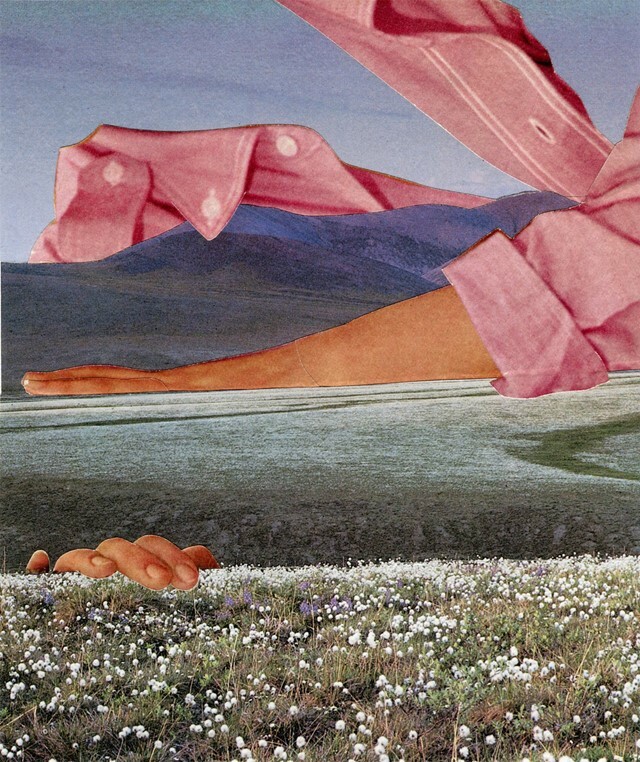 For collage it’s better to be loose.” Some of her collages might only have two elements while others incorporate more characters and intricacies, but there is always a sense of a curious scene playing out that invites a closer look. Lucy Dyson: As Much to Tomorrow as to the Past. THE END is at Michael Reid Gallery, Berlin, until February 23, 2019.